I am trying to rebuild my VAIO VPCEE2E1E laptop. So while it is switched off I press the Assist button, the computer starts up and you see the VAIO screen then it goes black, you then see a flicker and it goes black again and just sits there with the power on. How do I get it to work? The ASSIST button is used to perform regular maintenance of your VAIO computer or to solve problems you might encounter when using the computer. While the computer is on, the ASSIST button starts VAIO Care. While the computer is off, the ASSIST button starts VAIO Care Rescue. There has however been complaints with using the button. Some users say that the Assist button does not work and a black screenappears even when the laptop is on. If your PC won’t boot up, VAIO Care walks you through a data rescue and recovery process step by step. If you can still open Windows you can open VAIO Care manually. If you’re trying to recover VAIO back to factory settings just simply turn on your computer and press the F10 key several times before the VAIO logo disappears. If the Edit Boot Options window is displayed, press the Enter key. Select Start recovery wizard. To perform the custom recovery, select Tools instead of Start recovery wizard and click Start advanced recovery wizard. Follow the on-screen instructions. You should start by checking if the AC Power adapter is properly connected to the computer. You should also check if the wall outlet is properly connected. Use AC power if possible and in case you are using a battery, make sure that the battery pack is fully charged. It is possible that the computer has gone into standby mode. Just press any key to activate the display and remove the VAIO black screen. The monitor should flicker or light up. If your monitor still is not showing display you should at least see lights on the computer to show that it is awake. If no lights are on just push the power button and wait for the computer to turn on completely. The alteration in brightness could be causing the black screen. Ensure that it is not turned all the way down. Turn it up by pressing the Function Key (fn) and F5 at the same time. Use the right arrow key to increase the brightness. If the brightness did not change and the black screen on the VAIO is still there, the solution could be to check if you have an external monitor or devices connected. Check your display by pressing the function and F7 keys to cycle between the video output modes. Remove any external devices such as mouse, keyboard, USB devices, display monitor, docking station and any PC cards. If you tried all the above tips and your VAIO computer won’t boot and has a black screen, use Windows Boot Genius to fix all your Windows Booting problems. You can use Windows Boot Genius to fix the black screen, cannot boot issues effectively. Your phone stores a lot of valuable information and that information can be at stake if you have lost your cell phone. To protect the data on your phone in such circumstances, you will need its Serial and IMEI number. But how do we find the serial number or IMEI on iPhone? Here are all the way you can easily locate the Serial number and IMEI number on your iPhone! Whether you’re calling for support or want to find out if you’re still under warranty, you will need your iPhone’s serial number or IMEI (International Mobile Equipment Identity) number eventually. Just like your fingerprint, the IMEI or a serial number of your phone is also unique, and no two phones can have the same number. This serial number is particularly useful for cellular networks for identification and inventory purposes. Whereas the 15 digit IMEI number comes in handy when your phone has been stolen, and you need to lock it out of the cellular network. So how do we find this Serial number and IMEI number when we need it? Here is a list of all the possible ways to find the Serial number and IMEI number on your iPhone. This is perhaps one of the easiest ways to find the IMEI number on your iPhone.Dial *#06# on the keypad of your phone and your 15 digit IMEI number will be displayed on the screen. You can also find the serial number on your iPhone from Settings. Tap Settings > General> About> then scroll down to view the serial number and IMEI number. Things become a little easier for people having an iPhone 5 and all the models after that. To check the IMEI number of an iPhone, all you have to do it turn it around, and you will find the IMEI number written on the back of the device, engraved near the bottom of the case. For iPhone 3G, iPhone 3GS, iPhone 4 (GSM Model), and iPhone 4s: Remove the SIM tray, and the serial and IMEI number is written on the back of the tray. Connect your iPhone to the Mac and open iTunes. Click on the iPhone symbol to reveal the Serial number. By clicking on the phone number, the IMEI number will be revealed. Open iTunes. Then click iTunes from the menu bar and select Preferences. Click the Devices tab, then hold the cursor over the backup and you will see both the Serial number and the IMEI number of your iPhone appear on the screen. If you have kept the original packaging of your phone, things are going to become a whole lot easier for you. The IMEI number and Serial number are printed on the barcode label on the opposite side of the packaging. Did this article help you find your Serial number and IMEI number? If it did, don’t forget to share it with your friends! Recently, many people posted on Twitter, other social platforms and website forums, complaining of various Instagram problems. The most common issues are these 3: cannot log into Instagram account on iPhone/iPad, Instagram notifications not working in iOS 11 and Instagram crashing when I open it or upload video/photo. In this blog, we’re going to list the corresponding solutions to fix Instagram bugs on iPhone X/8/7/SE/6 Plus/5s/4, iPad and iPod Touch with iOS 11.0/11.1/11.2 effectively. This also applies to iOS 9/10 system. When you logged out of Instagram account on your iPhone, the first thing you need to do is re-type your username and password to try again. If that doesn’t help, you can try to reset the password via linked email account. You can also choose to send an SMS or login Instagram with your Facebook. Instagram notification failure is one of the most common Instagram problems that happens after iOS 11 update. Here we’ve gathered 4 ways to resolve the problem. Way 1: Turn on Instagram Notifications in Settings. Go to “Settings” >> “Notifications” >> “Instagram” >> “Allow Notifications”. Go to “Settings” >> “General” >> “Reset” >> “Reset Network Settings” and confirm it. Go to “Settings” >> “Do Not Disturb” >> tap on it to disable. If there is no Instagram option in Notifications of the settings on your iPhone, you can reinstall Instagram. After re-installing the app, you’ll get the pop-up message asking if allow Instagram notifications, tap “Allow” and you’ll enable Notifications for Instagram. Instagram kept crashing when opening the app or uploading photo/video on iPhone/iPad with iOS 11.0/11.1/11.2? You can try a hard reboot on your iPhone, which will end all the background running apps and release a lot of caches. If your home button or volume button doesn’t work, you can try Free ReiBoot, click “Enter Recovery Mode”, and then click “Exit Recovery Mode” to reboot your iPhone/iPad forcibly. This blog has shown you the best methods to solve the most frequently asked Instagram issues. Hope you can share your photos and watch your favorite Instagram stories after getting these issues fixed. Any further problems, please just feel free to leave your valuable comment below. Many users may have installed iOS 11 on iPhone/iPad/iPod, it’s pretty good for some new iDevice to run iOS 11, but if you are using an older iPhone like iPhone 5s, the iDevice may become very slow or unresponsive. There also many iOS 11 upgrade problems on iPhone 7/7 Plus/6s/6/5s like overheating, battery drain, WiFi, and Bluetooth issues. To fix this kind of issues, some users choose to downgrade iOS 11 to iOS 10.3.3. Here I will show you how to restore iOS 11 to iOS 10.3.3. Solution 1: Downgrade iOS 11 with iTunes. Step 2: Connect your iPhone via USB cable, launch iTunes and click on iPhone icon. Here you can see the status of your iOS device. Please be sure to backup your device, all your data will be lost in this restore process. Step 3: Hold “Shift” key and click on “Restore iPhone” button in iTunes. Choose the firmware you just downloaded, iTunes will help you restore the device to the previous version. Note: Please disable the “Find My iPhone” feature on your iPhone, or it cannot be restored. Solution 2: One Click to downgrade iOS 11 to iOS 10.3.3 with iAnyGo. Step 1: Download and install iAnyGo to your PC/Mac. Step 2: Launch iAnyGo and connect your iOS device with a USB cable. Click on the right button “One-click to downgrade iOS”, iAnyGo will help you check the available iOS for your device. Since Apple will close the signed panel of older iOS, so there may one or two available force you. Step 3: Click “Import” to choose the firmware you have downloaded before(or you can just click download, iAnyGo will help you download the matchable ipsw file), iAnyGo will check the firmware with your device to check if they match or not, after that, you can click “Downgrade” to start the iOS 11 downgrade process. Tips: Before downgrade, iAnyGo also helps you automatically backup the iOS device in case data loss. Step 4: Wait for iOS 10.3.3 downgrade process completed, now you have successfully reverted to iOS 10.3.3! Many people love to watch YouTube videos. Making a GIF from a YouTube video is a great way to share emotion with friends. GIFs are an integral part of communicating on social media. We can turn short scenes from popular TV shows, movies and videos into GIFs to express how we feel. In this blog, I’m going to introduce the top one application to turn YouTube into GIF. There are various kinds of applications and websites allow you to turn a YouTube video into a GIF. Among them, CutoMe can be regarded as the best free GIF maker. This small tool can help you to convert YouTube videos and other type’s videos to GIF flawlessly that completely saves the original picture quality. More importantly, you can make a GIF just by a few clicks, which is much quicker and easier than other methods. Cut any video clip as you want. You can also trim large bunch of movies, videos and camera recordings into small piece files. The cut and trimmed videos export with the same quality as original videos. Support Facebook, YouTube, WhatsApp video output format. Support Gif image output file format. Adoreshare CutoMe is a free small tool that allows you to cut videos just by two buttons. It’s quick and easy to converter YouTube videos to GIFs with this this application. And this procedure won’t cause any damage to GIF picture quality. Download and install this awesome tool – Adoreshare CutoMe on your Windows or Mac computer to see how it works. The program will be opened automatically after installation. Click “Open File” button or just drag video file to the program. Step 2. Cut the video as you want and. After loading the video completely, you can preview it within the program. You can use the two cut buttons to drag and drop to cut the video. Step 3. Output the video as GIF format. Set the output mode to “Gif” and click “CUTTER” button, your video will be trimmed to GIF automatically. This blog has shown you the best free tool to cut YouTube videos to GIFs. It is amazing than you can image. If you like it, please do share it with your friends. Thanks for your trust and support! Samsung Glaxy 8 can be a big surprise to us with many advanced designs, such us wireless charge, super big screen, iris recognition. 2017 is the 10th anniversary of iPhone, what should we expect about next generation of iPhone? Here you can follow me and I will provide an outlook of the next iPhone 8. To be honest, Apple is far behind the times when apply wireless charging in iPhone. Samsung started to use wireless charge with Glaxy S6, there also plenty of mobile phones equipped with wireless charge, such as Google Nexus 6, Motorola Droid Turbo and Nokia Lumia 920. According to some information in twitter, you can see there is a wireless charge module in iPhone. There is a rumor that iPhone 8 will use an edge-to-edge screen. I believe you can find many effect pictures in Google that the new iPhone equipped with a full coverage screen. Leaks by Benjamin Geskin show the new iPhone 8 will be thicker than the iPhone 7 Plus which is 158.2 * 77.9. No people could refuse a big screen. Most Android phones move the finger scanner to the back of phones so to make more screen real estate, like Xiaomi Mix and Glaxy S8. It’s still uncertain and dependent on other design features. If Apple doesn’t end up going with an edge-to-edge display and sticks with the traditional screen space, there’s really no reason not to include the Home button at the bottom. Due to lack of production capacity, build touch ID integrated in screen may unreality in next iPhone. The latest images from Benjamin Geskin show off the iPhone 8 with the new vertical dual-lens camera system lining up with his previous leaks. As more and more Android phones use dual cameras, it’s really a big step to bring users with 3D and AR experience. New iPhone (not only the Plus version) with dual camera are expected to sweep. That’s really not a good news that iPhone will bring a big price increase with those new features. Have you prepare your wallet? Let’s looking forward to the conference in this September. Some people found their iPhone won’t sync contacts after iOS 1.3 upgrade, this is an common issue on iPhone and most previous iOS system also have same problems. Normally, it’s for networking conditions are not very good, in my opinion, the problem is almost always with iOS. Here you can follow my tutorials to locate what is the problems and how to solve it. To get start, you can create a test contact in your iPhone, it will automatically backup to iCloud if you are using WiFi. With cellular connecting, please open Contacts app and drag down the contacts list to refresh it. Then login your iCloud account via web, if you cannot find the newly created contact, that’s the problem. Step 1:In iPhone, open Settings and tap on your Apple ID profile. Step 2:Tap on iCloud, toggle the switch button off behind Contacts to turn off the automatical backup with iCloud, then choose “Delete from My iPhone” to continue. Now open the Contacts app, all contacts will be deleted from your iPhone. Just take it easy. Step 3:Now go back to iCloud and toggle Contacts switch on. All contacts will download to your iPhone with seconds. The contacts won’t sync problem solved. If you cannot find some contacts or mistakenly delete it, here you can use a powerful tool – UltData to get back your contacts. Step 1:Download and install UltData into any available computer or mac and install it. Step 2:Connect your iPhone to computer with a USB cable. Click “Start Scan” to scan your iPhone for all data. Step 3:Wait for a couple of minutes for the procedure completed. Click on “Contacts” in left channel, you will see all contacts list out. Click on “Show Only Deleted” option, you will filter all deleted contacts in your iPhone. If You cannot find the contacts information you needed, you can choose other 2 options to get back your lost data from previous iTunes backup files or iCloud backup. With UltData, You can easily import and export all your contacts. As Apple Products are getting more and more popular, IOS users gradually used to using iTunes to sync data and update iPhone. However, various iTunes errors will be inevitably encountered in daily use. In this article we will tell you how to fix top 3 common iTunes errors in efficient ways. Actually, the easiest way for you to fix all iTunes errors is to use Tenorshare TunesCare. Only in 3 steps, you can fix all common iTunes errors completely. Step 1: Download and install TunesCare on any useful computer. Then connect your devices to the PC. Step 2: Now you can see the highlighted “Fix All iTunes issues”, then click “Repair iTunes” to download repair driver for iTunes. Step 3: Here TunesCare will repair iTunes driver in several minutes. After that, your iTunes is successfully repaired. iTunes error 3194 regularly occurs during an IOS downgrade, upgrade or even some restores. In most situations, its due to iTunes cannot communicate with Apple’s software update server. So if you are getting iTunes error 3194 when you restore iPhone, the first thing you should is to check the hosts file. Step 1: Check your hosts file. For Windows 10/8/7/Vista/XP, to navigate to C: /Windows/System32/drivers/etc/hosts. For Mac OS X, to locate the hosts file on/etc/hosts. Step 3: Here to connect your iPhone to PC and launch iTunes, and then shut down IOS device by holding the Power button. Step 4: Keep pressing the Power and Home button about 10 seconds, and then release Power button but hold onto the home button. After a while, your device is putted into recovery mode. Step 5: Use the restore feature in iTunes to update IOS device. In most case, the iTunes error 3194 won’t pop up again and you can freely use iTunes as usual. iTunes error 9 is usually shows up during updating or restoring iPhone with iTunes. When this error occurs, you can see a “Connecting iTunes” image on your IOS devices. You can try the following ways to bypass this error. Step 1: Check USB port and connector. When you receive the iTunes error 9 messages, the first solution come to your mind is you should check the USB port and connector. It is easily caused by a faulty connector. Step 2: Check iTunes and USB driver. You should download the latest iTunes, and check and update iTunes driver. Step 3: Try another computer. You can reboot your PC and check whether this error shows up again. If yes, you can try the same update or upgrading process on another computer. Step 4: Firewall, security and anti-virus. In this case, you should try your check whether iTunes be marked as malicious software. After that, you can use iTunes normally. iTunes error 1002 is most common when you trying to downgrade. Below is the solution for you to fix iTunes error 1002. Step 1: Put your iPhone in DFU. (Here is a quick guide to enter your iPhone into DFU mode). Step 2: Use Redsn0w to create a custom IPSW file of the iOS you are trying to install. Step 4: Now, save the file and then try restoring the iPhone to the custom IPSW file created. Step 5: If the hosts file edit method doesn’t work, you can try using TinyUmbrella. When trying to restore, open TinyUmbrella and then click on Start TSS Server. And then try restore. If you have any trouble about following the guide above to fix iTunes errors, welcome to leave your issues on our website comment sections. To iOS 10 update, a part of iPhone 7 users face the trouble of iTunes logo screen stuck. In the process of iOS 10 update, iPhone 7 stuck iTunes logo screen. How to fix the trouble is necessary for those users. Below is a tutorial for us to learn how to deal with that issues. 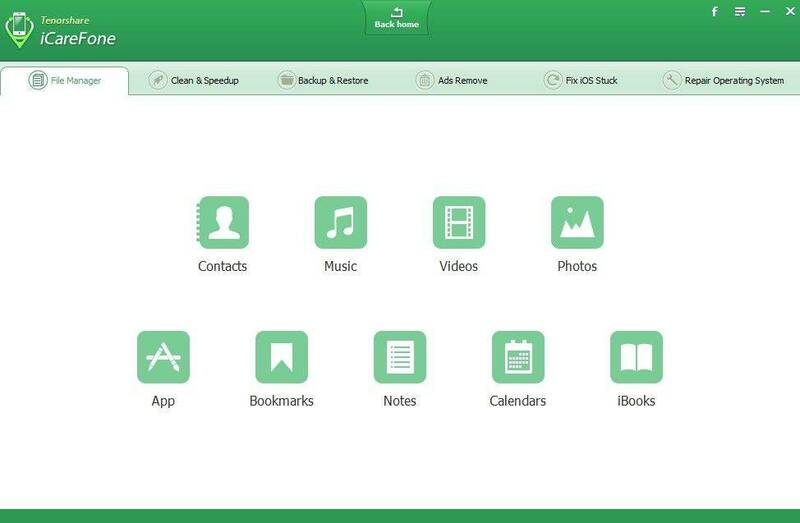 Tenorshare iCareFone is such a powerful tool to help us fix all iOS devices stuck issues. For example, in the process of iOS 10 upgrade, iPhone 7 stuck in iTunes logo screen. Here you can use iCareFone to fix this trouble in three minutes. Step 1: Download iCareFone and install it on any accessible computer. Step 2: Then connect your iPhone 7 to the computer, running iCareFone. Here to choose “Fix iOS Stuck”, then one click to put your iPhone 7 in recovery mode. If you cannot connect your iPhone with iCareFone, you can click to “Enter DFU Mode”. Step 3: After just several seconds, you can click “Exit Recovery Mode”. You will find the problem of iPhone 7 stuck in iTunes logo screen has been fixed. Step 1: To Press and hold the Home button and the Sleep/Wake button at the same time for a few seconds. Step 2: Here to keep holding the two buttons until you see the screen go black and then see the Apple logo on the screen. This is the easiest way to get iPhone out of stuck. If you still cannot get your iPhone reboot to normal state by this method, try other methods below. We all know, to most common users they have no knowledge about how to restore iPhone in easy way. Even in the case that they are using it every time. So below is simple tutorial for us to learn how to deal with the case that iPhone 7 stuck iTunes logo screen in efficient way. Step 1: To restore your iPhone is the last resort when iCareFone even does not do the trick. By doing this all data in your iPhone will be wiped. Restore option. Click Restore and wait for iTunes to complete the process. In the post, you can choose one method to exit iOS or iPhone 7 iTunes logo screen. If you have any trouble in the process of following the guide, welcome to leave your question on our site comment sections. To iPhone users, Siri is much convenient for their daily life. Just one word, you can know everything. But sometimes it is hard for user to get Siri, so below is a tutorial to teach us how to get Siri on iPhone 7 iOS 10 no Jailbreak. We all know that Siri is one of the crowning achievements of newer Apple devices, follow this guide and you’ll be giving voice commands to your iPhone in no time! Step 1: Install a third-party app. Even if your device doesn’t officially support Siri, you can still install apps that mimic the functionality. One of the most popular of these is Dragon Go! from a company called Nuance.Nuance provides the voice recognition software for the official Siri product, so Dragon Go! shares a lot of the same functionality. Step 2:Use the built-in voice control. While not as snazzy as Siri, the built in voice control on the iPhone 7 is actually quite advanced. Just like Siri, press and hold the home button to activate it, and then speak your command. Step 3:Use Google Search. The Google Search app sports a voice command system that allows you to interact with your Google searches and accounts. While it does not integrate with many services provided by the iPhone, it can be useful for web surfing. Step1: Jailbreak your Phone. In order to download a version of Siri that works with older devices, your iPhone will need to be jailbroken first. This will allow you to access Cydia, which can install apps not allowed on the official App Store. Your device must be running iOS 5.1.1 or later. This method has been known to cause issues on older devices. If your device loses functionality, you may need to restore it. Step 2:Open Cydia. You will need to add the SiriPort repository before you can download it. Go to Manage – Sources – Edit – Add. Then, type “http://repo.siriport.ru” into the box that appears. Tap “Add Source”. Step 3: Wait for the repository to be added. When it does, search for the “Siriport(original) iOS 10” Package. Install it and rebootyour iPhone 7. Step 4: Open Settings on your iPhone 7. Scroll down until you find the entry for SiriPort.ru. Select this, and then tap “Install Certificate”.This will open a Safari window displaying the Install Profile screen. Tap Install, and then tap Install again in the upper-right corner. On the Profile Installed page, you should see the word Trustedin green letters. Tap Done and then close the Safari window. Step 5: Press and hold the Home button to start Siri. There may be a delay when using this method, because the program has to communicate with servers overseas. If you have any other problems about iPhone, you can try to use the powerful tool-iCareFone. This tool can help you tuneup your iOS devices in top performance. It can help you fix iOS stuck issues during/after iOS upgrade, restore or jailbreak and so on. In the end, have you got how to get Siri on iPhone 7 iOS 10 no jailbreak easily? If there is any trouble for you in the process of following this tutorial, you can leave the questions on our site comment sections.